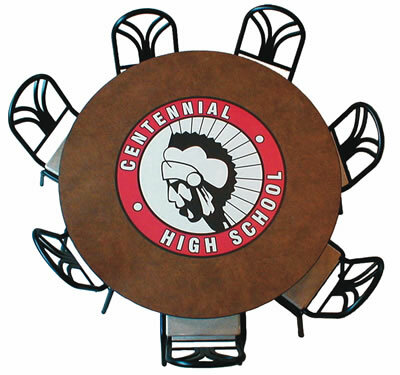 School mascots inlaid in the tabletops create school spirit! Sports is big at Montebello High School, so we made graphic tabletops using their favorite soccer ball and football look. 45 rpm record graphic tabletops highlight the Graves Middle School Panthers. At Compton High School, we created colorful abstract art forms to brighten up the large room. An ADA accessible table with large Mt. Whitney Pioneer logo. At Arroyo Valley High School in San Bernardino, graphic tabletop designs include historic Route 66 highway signs and 45 rpm record tops. The Pasadena High School Bulldog mascot growls at you as you dine. At Whaley Middle School in Compton, CA, the Whaley Warrior is proudly displayed.